Last week, I organized a collective cooking for a reunion with past friends I haven't met for at least 4 years. The theme was vegetarian cuisine but ended up to be a mushroom theme as we were using it as a main ingredient. My friend from Pharmacology made a scrumptious mushroom dumplings with a reduction of vegetable stock and white wine. This simple dish is a must try. 1. Chop assorted mushrooms and half of the shallots. Mince the remaining shallots. 2. In large frying pan, heat oil over medium-high heat. 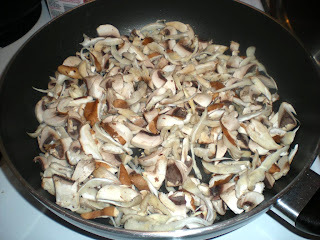 Sauté mushrooms and shallots until cooked. Add a couple tbsp of white wine to taste. Seson with salt and pepper. 3. Transfer mushrooms to a bowl and add chives to taste. Set aside to cool. 4. Lay a dumpling skin. Wet all the edges with water. Place a tbsp of mushroom filling in the middle of the skin. Fold sides up to form a half-circle, and pinch the edges to seal. Continue the same process for the rest of the gyoza skins until filling is gone. 5. 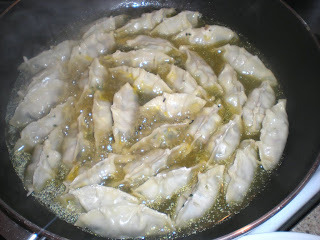 In the same frying pan, cook dumplings until light golden with olive oil. 6. Add vegetable stock with white wine until 1/2 filled the dumplings. Boil over medium-high heat until stock reduces to about 2/3. Turn dumplings during cooking. 7. Serve and garnish with chives. I can taste the mushrooms now! These would also be really good with a little chili oil. I love making dumplings and often use mushrooms (since I'm a vegetarian). I really like your use of the white wine reduction - I'm sure it really brings out the mushroom flavor - will have to try that next time! I love using wine to infuse the flavour into any dishes. 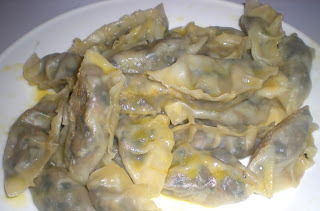 Well yes for its look, but no for the ingredients used, as Chinese does not use white wine and mushrooms as a main filling and these dumplings are not dipped in soy sauce with ginger. 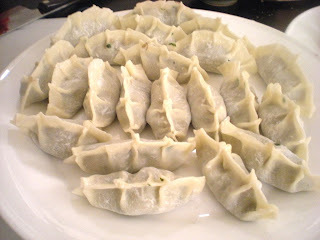 these look so good - i have never tried to make dumplings before but this looks easy! I am not used to cook dumpings but yours look great !! thanks for the sahring ! You have a nice blog with lots of interesting recipes! These mushroom dumplings are one thing I'd like to definitely try!